Humble Bundle in collaboration with Magix is back at it again - this time you can get hold of both Vegas Movie Studio 15 and the professional video editor Vegas Pro 15 Edit for only $25, and for this price are additional software such as the effect pack HitFilm Movie Essentials included. I bought the Magix/Vegas Pro bundle last year and was really happy about it. Since the Vegas Pro 15 includes a much better looking interface in comparison to version 14, and the built-in support for using 3D LUTs, I'll get this deal as well. 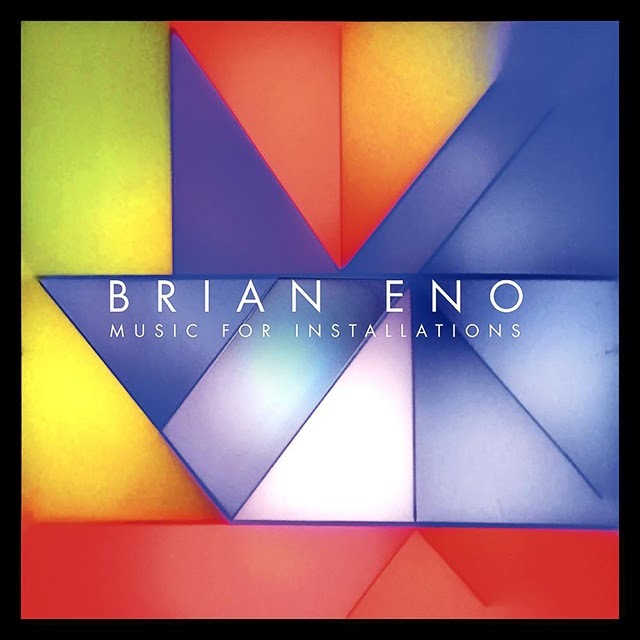 Listen to Brian Eno's release of the six-CD set "Music For Installations" that contains many rare and previously unreleased tracks. You find the complete 24 tracks YouTube playlist here. 'Music For Installations' is a collection of new, rare and previously unreleased tracks, all of which will be available on vinyl for the first time. All of the material was recorded by Eno for use in his installations covering the period from 1986 until the present (and beyond). Over this time he has emerged as the leading exponent of generative music worldwide and is recognised as one of the foremost audio-visual installation artists of his time. For a lenghty review of "Music for Installations", head over to Pitchfork that rated this album eight out of ten. In this animated video, as part of the release of his book "Principles", hedge fund manager Ray Dalio shares his principles for success in eight segments. In this rare 40 minutes long video from 1981, advertising giant David Ogilvy shares some useful marketing techniques and strategies, as well as anecdotes from his private and professional life. The video is entitled "The View from Touffou" since it was being filmed at Ogilvy's home, a French castle Touffou he bought in 1966, and was aimed toward Ogilvy's staff and clients. The below version is one of the better ones I found in regards to quality, despite it being hardcoded with a Czech subtitle. The description above may sound cliché, but when I watched this documentary upon its release, I was happily surprised that it gave me, not only great financial advice, but advice for a happy life as well. With a net worth of over $60,000,000,000, Warren Buffett is truly a one-of-a-kind billionaire. The legendary investor still lives in a modest home in Omaha, and drives himself to the office every morning to manage Berkshire Hathaway. This documentary chronicles Buffett's evolution into one of the wealthiest and most respected men in the world. 'Instant Dreams' is the title for a documentary that follows individuals from all walks of life that still use Polaroid cameras and its instant film. The TV series "Contact: Magnum Photos" explores in ten 30 minutes long episodes some of the most iconic photos from around the world shot by photographers from the Magnum photo agency. This is a real treat for photography lovers so watch it over at archive.org while you can. Watch the trailer for the upcoming theater release "Free Solo" about soloist climber Alex Honnold as he prepares for and climbs the face of the rock El Capitan in Yosemite National. Film director Ingmar Bergman was a frequent writer of notes. 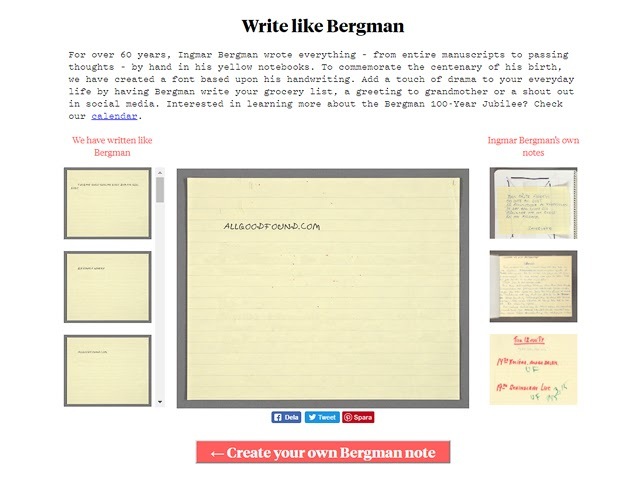 To celebrate Ingmar Bergman's 100th anniversary, Bergman's characteristic handwriting has been made into a web font. Try it out for yourself here, but be aware that what you'll scribble end up for all to see at the left side. Via Swedish Television. H/t Feber (SE). I wrote about the street photography documentary "Everybody Street" in 2013 as one of the best documentaries I had seen recently. In it, you'll get to know some of the best street photographers out there, and get lots of great New York scenery. Or watch the cut down version on archive.org.